1. Combine all ingredients except kesong puti and cooking oil. Form into round burger, and set aside. 2. Have ready heated burger pan. With oil pan grill the burger until done. 3. 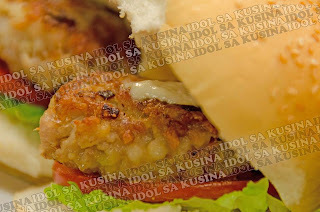 Place grilled burger onto the bun then top with lettuce, tomato slices and kesong puti. Garnish with chopped parsley. Skewer to secure the burger.